New satellite images have shown the alarming speed at which Pakistan is constructing a weapons-grade nuclear reactor. The aerial images, taken on April 20, show the rapid building progress of the fourth reactor to produce plutonium in Pakistan's Khushab facility. The site was barren in 2009 and the facility 'costing billions' was undetectable by satellite just 17 months ago, but has since grown at an alarming rate. The facility in Khushab is the fastest growing nuclear program in the world, with the speed of the latest reactor's construction prompting concern from U.S. officials. 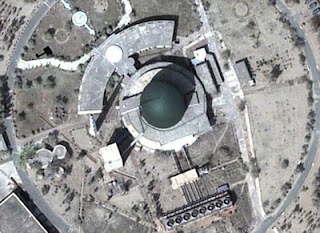 Pakistan first revealed the Khushab site and its plutonium production facility in 1998 after the country’s first nuclear test. Although the U.S. has provided Pakistan with $20 billion in military and economic aid since September 11, 2001, it has been said that there is 'no explanation' as to how Pakistan are paying for the latest reactor. Paul Brannon, a nuclear analyst with the Institute for Science and International Security, said: 'The buildup is remarkable. 'You can see the square of the reactor building, you can see the inner square of the reactor hall where the actual reactor goes, and if you measure the dimensions of the building it matches up exactly to the second and the third reactors. U.S. officials have been watching the Khushab facility for some time, but say there is no good explanation how Pakistan is paying for this. The rapid progress of the nuclear facility comes as tensions between the USA and Pakistan increase. 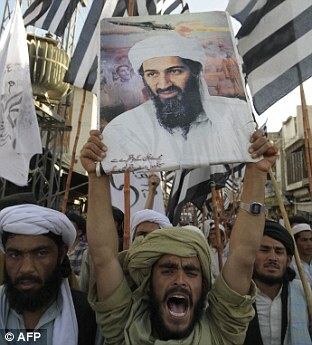 Pakistan officials welcomed the death of Osama Bin Laden after a raid by U.S Navy Seals, but were still unhappy they were not informed about the attack, saying it 'violated Pakistan's sovereignty'. And there was further anger yesterday when a Nato helicopter attacked a Pakistani army post near the Afghan border today, injuring two Pakistani soldiers. Senator John Kerry, who chairs the Foreign Relations Committee, returned from Islamabad on Tuesday after Pakistan agreed to return the stealth helicopter tail of the downed Blackhawk MH-60 damaged in the raid that killed Bin Laden. Senator Kerry has since warned about cutting off aid to Pakistan. He said: 'Right now, we have about 100,000 reasons for worrying about our relationship with Pakistan. Pakistan controls 70 percent of the supply routes into Afghanistan, according to Pentagon officials. Defense Secretary Robert Gates and others have warned that cutting off relations or aid to Pakistan would be dangerous because the government and military of Pakistan could fall under more influence from Islamic radicals who are sympathetic to Al Qaeda. It is also feared any nuclear weapons made at the facility could fall into the hands of hardline militants.